Prunus 'Amanogawa' is a very columnar ornamental cherry tree, ideal as an eye-catching specimen for smaller spaces or for lining avenues. The narrow form will grow to a height and spread of just 6 x 2 metres in 20 years. In April, the upright branches are smothered in pale pink cherry blossom. The large, semi-double, flowers have a pleasant and subtle fragrance. Bronze-green spring foliage turns to mid-green in the summer and then bursts into orange and red colours later in the year for an autumnal display. Prunus 'Amanogawa' is a good choice for urban areas, as it is both tolerant of pollution and compact. 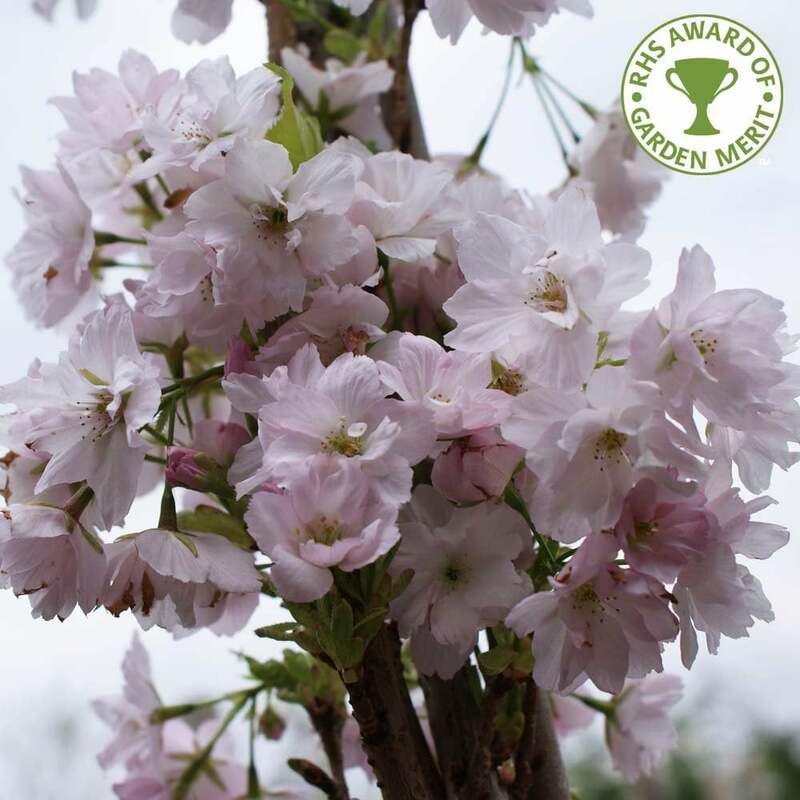 It will do well in most soils and if planted in a sunny position, this RHS award-winning Flowering Cherry tree will not disappoint. Our pot grown Amanogawa Japanese Cherry trees can be planted at any time of the year. Choose a location away from strong winds to protect the blossom display, then remove weeds and grass within a metre radius. Dig a square hole as deep as the root mass and nearly twice as wide. To help the tree establish more effectively, sprinkle root grow in the hole. Remove the pot, gently loosen the roots and place into the planting hole. Mix 50% of the original soil with 50% compost, fill in the hole and firm around gently. Avoid banking the soil up around the collar of the tree. We recommend planting Flowering Cherry trees (except multi-stem forms) with a stake and tie kit to ensure the roots are well anchored - instructions are in the planting guide. When planting Japanese Cherry trees in spring or summer, water well for the first few months. Increase watering if there are extended periods of hot or dry weather. When planting in autumn, you may only need to water a little. Although it is possible to leave young Amanogawa Cherry trees to their own devices, carrying out formative pruning for the first few year will create a more balanced branch framework. Prune after flowering i.e. after the petals have dropped but before the new shoot growth appears. It will then require less maintenance in future and after two to three years, you will only need to remove occasional damaged or unwanted branches.